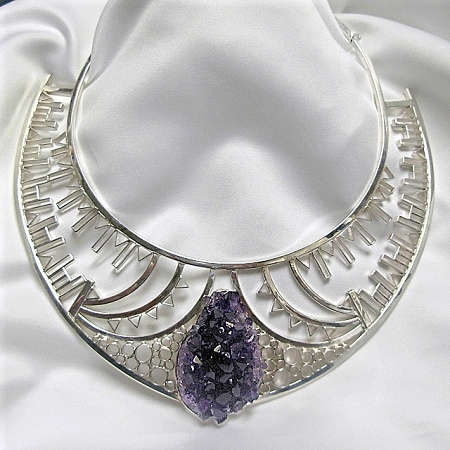 Cubist Jewelry - This is a handcrafted bold artistic sterling silver statement collar that is constructed from geometric shapes of silver tubing that are soldered individually within a frame and features a beautiful large geode crystal purple Amethyst gemstone. A Sterling Silver collar necklace accented by a natural geode amethyst. Each geometric silver shape is soldered separately. This is a one of a kind necklace for the collector. This hand fabricated necklace is signed and created by Aaron Rubinstein and Modern Art Jewelry.